Reliable smoke machines, available in various sizes to suit your needs. Indoor and outdoor use. 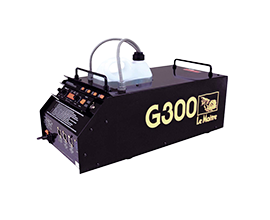 Professional reliable smoke machines, available in various sizes to suit your needs. Indoor and outdoor use. Our inventory includes G150's, G300's, Martin Magnum 2000s and JEM Roadie Compacts (our biggest smoke machines), plus Swing Fog portable petrol smoke generators for when you need serious fog where there's no power. JEM Roadie compacts and G300's can also be used as hazers, we also supply Unique 2.1 Hazers. All machines come with either remote controls or DMX interfaces. DMX desks are also available to hire. 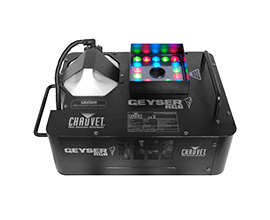 The Chauvet Geyser is a new item to our hire fleet and a great alternative to CO2 Jets. This powerful fogger blasts a vertical stream of quick dispersing fog while simultaneously illuminating it with 21 high-power (3 W) LEDs creating an iluminated smoke geyser. Smoke jets are the perfect CO2 Jet substitute for events where using CO2 Isn't possible such as for schools and colleges. Another advantage of the smoke jets is that unlike CO2 they are a fairly quiet smoke effect. Smoke jets create a quick dissipating smoke plume up to 5m in height, the smoke plume can also be lit with the built in LEDs to create a new dimension to the effect. The MagicFX Smoke jet Can also be mounted in trusses and blow smoke downwards and sideways. 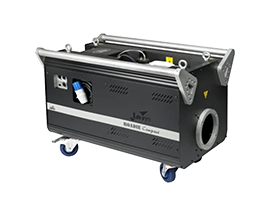 We have smoke jets available to hire as single units or smoke jet kits complete with cabling and controllers to run them. Martin's industry-standard Jem Roadie X-Stream Compact's are our biggest smoke machines. No only are these perfect for Arena's and on Festival Stages when you need a serious amount of smoke, but they can also be used as the ultimate in high volume Hazers and are perfect for large laser shows. Warm up time is 9 minutes with a 9.5 litre fluid capacity giving a continuous smoke output of up to 2500 m³/min and a maximum operating time at full output of 90 minutes. 240v Single phase 16 Amp power Supply required. On Board 3 and 5 PIN DMX control. 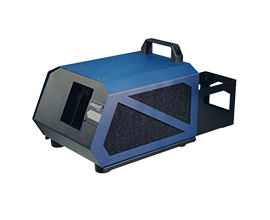 The DNG Low smoke generator is the perfect solution to touring with a low smoke effect. The DNG low smoke machine requires no CO2 or dry ice to create a powerful thick low lying fog effect. The smoke machine has a built in refrigerator chilling the smoke before it leaves the machine. 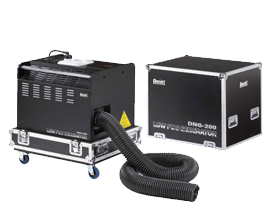 The DNG low smoke machine hire comes in a flightcase for easy storage and movement around venues or on set, unlike other machines it runs from 2x 16amp power supplies so no need for three-phase here; just attach the flexible trunking and heat up to use, it can be used via the controls built into the unit or via DMX. 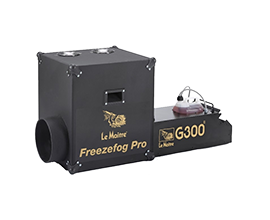 Perfect for stage and theatres, clubs, catwalks and arenas, we offer high power liquid CO2 freeze fog chiller units coupled to G300 smoke machines to provide the coldest low lying fog. We also supply specially mixed low smoke fluids for those occasions when you need quick dispersal after an effect, for instance to prevent camera white out. 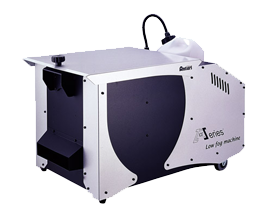 Our smallest low smoke machine hire the Ice 101 is a compact unit perfect for small events, theatres, weddings or for schools and colleges. Needing only ice cubes to chill the low smoke fluid this is a simple machine to run avoiding the hassles of using CO2 or dry ice to create a low fog effect. This machine has two options for use the first option of DMX or it can be run via the handheld controller included with the machine. This is a great low budget low fog machine perfect for small productions. Our Unique 2.1 high performance variable output water-based hazers are our most requested hazers as they are ultra reliable, almost silent and leave very little residue. 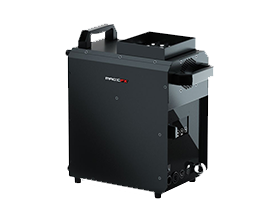 All haze machines have built-in DMX and a 2 litre fluid capacity (enough for 50 hours of continuous output at normal haze setting), and a 60 second warm-up time.